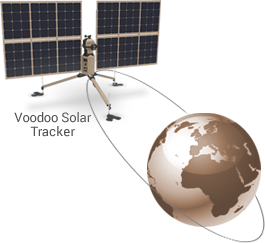 Voodoo Solar Tracker boosts solar power output up to 40%. 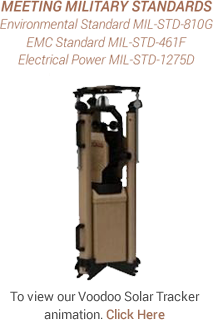 Merlin’s patented dual-axis tracking continuously repositions solar panels, ensuring they receive direct solar exposure. Fixed arrays receive indirect exposure wasting up to 40% of the solar energy in a day. Voodoo is portable, lightweight, and (dis)assembles easily in five minutes. At less than 150 pounds, Voodoo is FedEx shippable in one package. Voodoo produces 12 or 24 VDC, integrates with Merlin’s power management products (e.g. for use in a microgrid or as a hybrid battery charger), and operates independently of panel manufacturer. Multiple units can be wired in parallel or series for additional power. Designed for military missions, Voodoo is ideal for size, weight, and power (SWAP) constrained applications. Automatically docks panels in high winds to prevent damage. Portable, lightweight, and assembly/disassembly in five minutes. Supports multiple photovoltaic panel brands. Available in 12 VDC or 24 VDC to meet customer requirements. Array Width: 6 ft. 9 in. ; Array Height in Parked Position: 6 ft. 1 in. .